I'm not the first to say that the most exciting contemporary American poetry seems to be coming from 'younger' black writers like Joshua Bennett. The reason seems to be that there is more at stake, that anyone paying attention to the news in the last few years can see race relations are not that good in America, and some of us like to think the poetry could/should be about that, about what's going on politically, socially, culturally, in America or the world. Whereas, one could be a little cynical about popular white poets so comfortably comfortable in their middle-class-ness that they seem to not have much of urgency to write about, so delve into cleverness, with poems of odd humor that lead nowhere (Dean Young), or sound like pure gibberishness (Charles Bernstein) or go for a pithyness-lite than merely amuses (Billy Collins). Or, while I'm burning bridges, suburban family life (Sharon Olds) or finding life lessons looking out the window at birds (Mary Oliver). All of which culminates in the vague pleasantness of, at its worst, The Writer's Almanac. I say all this having read and enjoyed all of those poets (except Bernstein) and The Writer's Almanac. But meanwhile, there are other poetries going on taking more risks, because challenging the status quo, challenging white middle-class apathy, which I always thought poetry was really supposed to do. I do not belong to the sobbing school of Negrohood who hold that nature somehow has given them a lowdown dirty deal and whose feelings are all hurt about it....No, I do no weep at the world—I am too busy sharpening my oyster knife. Strong words, implying, with the knife, a readiness and willingness to strike back at the world, with Hurston's, and Bennett's, knives, of course, words, though Bennett does seem to be jabbing his knife, a little, at those in the sobbing school, those in the black community who aren't sharpening their knives—this made even more explicit by the cover, featuring a photo (credit not given anywhere that I can find) of a building burning in what looks like city projects, while some young black men in the background watch casually and others in the foreground play basketball. The message seems clear: no matter how badly the world of black America is burning—and we all know the cause(s)—there are those in the black community who just watch, or worse, not pay attention at all, not care. Bennett is known, or has been known, for spoken word poetry, and tours regularly in that capacity (including reading for President Obama!). When I was younger, the poetry slam/performance poetry poets I saw and heard at the Nuyorican in New York and The Green Mill in Chicago were all vehemently, rabidly, anti-academic and anti-intellectual, and from what I've seen of the scene in Portland now, that seems still to be the case. Not that spoken word is exactly the same, but it came out of them, perhaps, and comes from the same aesthetic and, if one were to criticize all three, one might say they put the emphasis more on the performance than the poetry (I asked Saul Williams a Slam Nation movie screening in Chicago once about that and his response was, "The poetry is performance")(or something like that). But Bennett also happens to have obtained a PhD in English from Princeton, making him perhaps some kind of spoken word/academic hybrid. his father's hands like the insides of a loganberry pie. & magnolia blossoms & it went viral in Mississippi. Richard Wright had a zoologist twin sister named Giovanna. to hoop. Reputable sources swear he was trash with his left. he beat Earl "The Pearl" Monroe in a game of H-O-R-S-E. Took him for seven large that night on a bad bet. & a treble clef. I tell you, Richard Wright could fly! from the saddled back of an inner-city tortoise. Richard Wright taught us how to forfeit. Richard Wright was steel-driving man. Richard Wright outlived everything he ever built. Richard Wright built the White House. The absurd humor, the use of 'chant' repetition, the pop culture references, the conversational language, above all the readability (in both senses of that word, with eyes and out loud) all point to an energetic reading. And yet, I'm not sure the subject matter would go over at a spoken word performance. I'm not sure most spoken work audiences, or poets, know, or want to know, who Richard Wright was. Nor would they get the horse references. I suspect though, that Bennett is probably such a good performer that you might not need to know, that it would be a pleasure just to hear (and see) him. But there are softer, quieter, poems of Bennett's that would, gasp, almost sound ok on The Writer's Almanac, like "Love Poem Ending With A Typewriter"
like the grooves on a bullet. That first line, "And maybe no one's happy" just captures the human condition, period, beyond black and white (or yellow or red or whatever, green and purple) though there's definitely a middle-class feel, which Bennett seems to be poking fun of, a little. That is, poking fun at himself as a former-black-man-of-the-streets-now-intellectual who reads Rilke and Foucault. The one small odd detail that would get this banned from Garrison Keillor's show (and there are others later in the poem) is the "We fit / like the grooves on a bullet" which I'm going to go out on a limb and say most white middleclass couples would not compare themselves too. This is a little reminder, to us and perhaps to himself, that because he's black, his middleclass comfortableness might not be so comfortable, that he'll always be a little closer to (systemic or cultural) violence than any of us, including himself, would want. In this context, in this poem, the 'shame' and 'home' are bigger than Yonkers: Bennett's talking about the larger world, black America, and the shame they're made to feel. Which brings us back to the Hurston quote, the shame of "the sobbing school" types, whom Bennett wants to deny, but with whom he nonetheless has to at least deal, through anger, or humor. Or Art. Beauty. That's the saving detail Hurston gives us, which Bennett uses: the oyster knife. It can be used for violence, but its main purpose is, like poetry, for finding pearls, beauty, the beautiful. 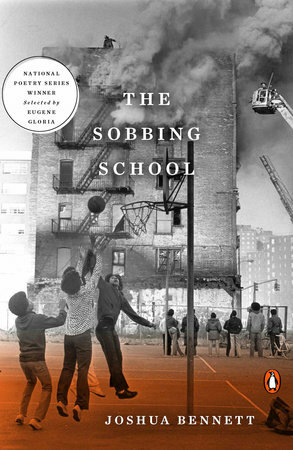 The Sobbing School is a call to get up, stand up, yes, but it is also a reminder to look for the beauty in life. Because, Bennet says, what's a world worth fighting for if there's no beauty? Ella Fitzgerald is from Yonkers?? !